So, first things first, find a few contractors and ask for bids. Right? Before asking for a single bid there are some very important steps you should take. 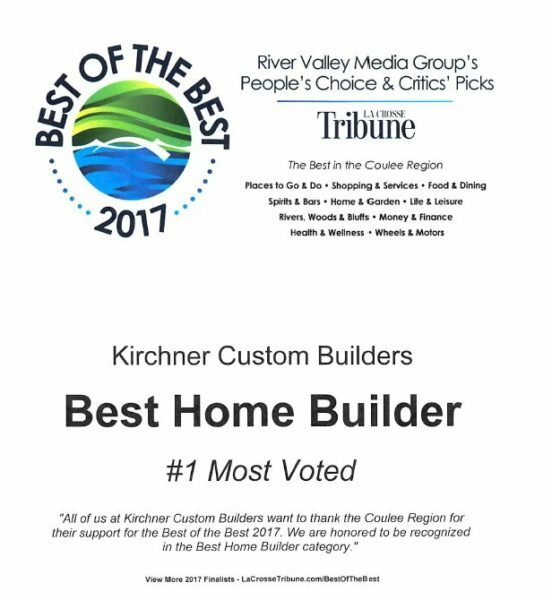 When building a custom home you need a general contractor that is honest, accurate, timely, and efficient. Someone you get along well with. You want them to be up-front, accurate, and fair with their pricing. And, ideally, someone who is good at problem solving and who has a “make-it-work” attitude because obstacles and surprises are bound to occur. If you choose the wrong contractor the flip side of that could be true, and you surely don’t want a contractor who is untrustworthy or imprecise. You don’t want someone who you struggle to get along with or who communicates poorly. You don’t want to overpay or run months behind schedule. When you have a concern or face an unexpected challenge, you don’t want your contractor to simply say, “No, I can’t do that” without making every effort possible to find a good solution. The good news is you can assure you find the right contractor by investing a little time and due diligence. Marty Kirchner, general contractor and co-owner of Kirchner Custom Builders, suggests taking the following steps when searching for a general contractor for your custom build home. What home features are most important to you? The more information you can supply the easier it will be to determine which contractors are a good fit. Ask around for referrals and look online to find general contractors in your area. Go to their websites and look at pictures of their work and see what types of homes they build. If you plan to build a $200,000 home you don’t want to go to a contractor whose body of work consists of only million dollar mansions. The alternate is true, as well. If you’re building a luxury home with top of the line finishes, you don’t want to choose a contractor who builds basic, mid-range, budget-friendly homes. The goal is to find contractors who build homes that are similar to what you want. Discuss your needs and find out if it’s the type of project they are willing to consider. Don’t be surprised if some contractors turn you down, this simply means they have determined that they aren’t a good fit for you. By calling you will also get an idea of their timeliness and communication skills. If one contractor doesn’t return your call for over a week or another doesn’t offer any helpful assistance, then these are not contractors you want to be working with. Cross them off your list. Once you’ve made some phone calls and you have a short list of contractors that you like, ask to meet with them in person. This is an opportunity to get to know them a little better and to get into more detail about the project. You will find out a lot about their values and personal qualities by talking to them in person. It also gives the contractor an idea of how serious you are. If you’re a tire kicker looking for lots of bids, he may not be interested. But if he knows you’re serious and that you’ve narrowed your list of potential contractors down to 2 or 3, he will likely be willing to give you and your project serious consideration. Preferably a finished home and a home in progress (if that’s possible). If the contractor doesn’t want to show you or cannot show you previous builds, that’s a bad sign. It could mean he doesn’t have a good relationship with his past clients, it could mean he’s not confident in his work, or it could mean he’s not that interested in your project. All of those are signs that he’s not the right contractor for you. Seeing a contractor’s work is the best way to determine if the quality of his work is up to your standards. Photos don’t always show the finer points. Would you buy an existing home based on photos alone, without going to see it? No. You want to walk through it and see it with your own eyes. By looking at a contractor’s work firsthand you can see the technical and aesthetic traits of his work and how well he tends to the finishing work and small details. The general contractor for your custom built home is someone you will be working with for months, maybe even a year or more. You want a contractor who makes the experience of building your home a good one, not an unpleasant one, and you want him to deliver high quality work for a fair price. These 5 steps will help find your ideal contractor. Now it’s time to ask for a bid. 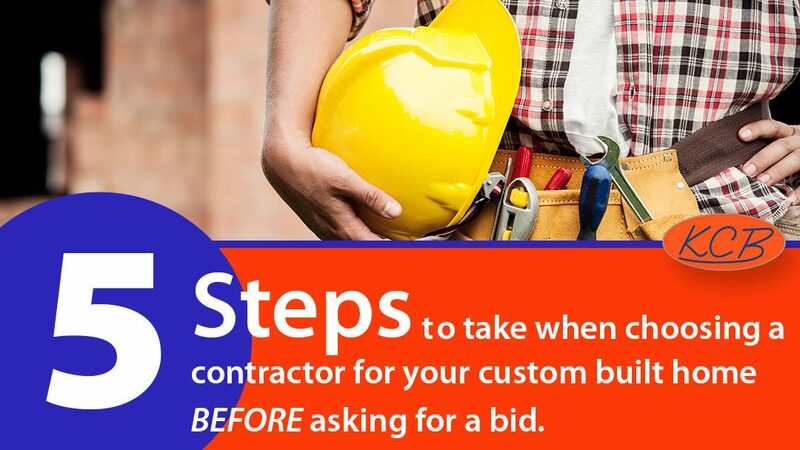 Once you have narrowed your list of potential contractors down to 1 or 2 (3 at the most), then you can confidently move forward with the bidding process.